A bird can be an amazing pet, but friends with feathers are very different than those with fur, and birds require specialized care to live long, healthy, well-adjusted lives as pets. Choosing a starter bird is a great way to learn the basics of bird care and whether one of these pets should fly into your life. Unlike more familiar pets such as cats and dogs or small animals like ferrets, rabbits and guinea pigs, birds can be more challenging animal companions. Birds need specialized diets and foods to keep their bills in top shape, and they may need their wings clipped regularly to prevent escapes. Many birds have long lifespans, requiring dedicated commitment from any caregiver. Most birds are less willing to be petted and handled than other pets, and it is necessary to find an avian care specialist veterinarian to be sure a pet bird gets proper health care. Choosing a starter bird, however, minimizes these extra challenges so even novice bird keepers can enjoy a new feathered friend. More Popular: More familiar pet birds are easier to find proper supplies and vet care for. Smaller: A smaller bird requires less cage space and will not need as much out-of-cage exercise. Less Expensive: More exotic pet birds are often more expensive to purchase and care for. Hardy: A starter bird will be more forgiving of inexpert care and more resistant to disease. Quiet: Many birds can be loud with singing and whistling, but starter pets are usually quieter. Less Picky: An easier pet bird will have a generalized diet rather than needing hard-to-find feed. Often labeled as either finches or canaries, these birds are active, but because of their small size, can get plenty of exercise in their cages and don't require much extra activity. They thrive in pairs and don't require extensive interaction with their human friends. They have soft, chittery voices and easy seed-based diets. These birds come in a diverse array of different colors and patterns, and generally live 2-10 years. Also called parakeets or budgies, these colorful birds are the smallest type of parrot in the world and are one of the most popular cage birds. They are native to Australia, and captive breeding has bred a rainbow of budgies to choose from, including green, yellow, white and blue. These birds are playful, intelligent and curious, and enjoy some interaction with their owners but aren't overwhelming. Budgerigars typically live 5-10 years. Slightly larger birds, cockatiels are familiar with their gray bodies, yellow and whiteheads and expressive, elegant crests. These birds have distinct personalities and enjoy interacting with their human partners, but are still small enough that they can be happy in an appropriate cage with suitable enrichment toys. Cockatiels can learn tricks, and they have a vocabulary of different whistles. These birds can live 15-20 years. 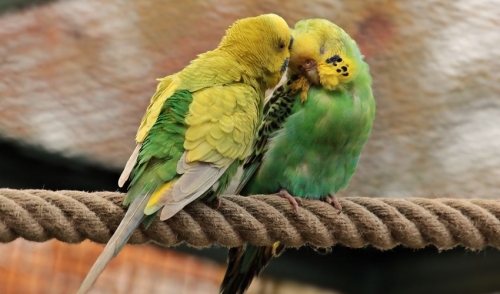 While finches, budgies, and cockatiels are excellent starter birds, other bird species such as smaller doves, lovebirds and conures can also be amazing avian friends for bird lovers. Only the most experienced and dedicated bird keepers should consider the largest and most demanding bird species such as macaws, however. No matter what type of bird you welcome into your home, be sure to research the individual needs of the species carefully so you can provide a healthy habitat, nutritious diet and proper care for a happy life for both you and your feathered friend.